Apple's new app store for the Apple TV platform now features over 2600 apps, with an average of 447 new apps coming each week, according to recently-published third-party data. 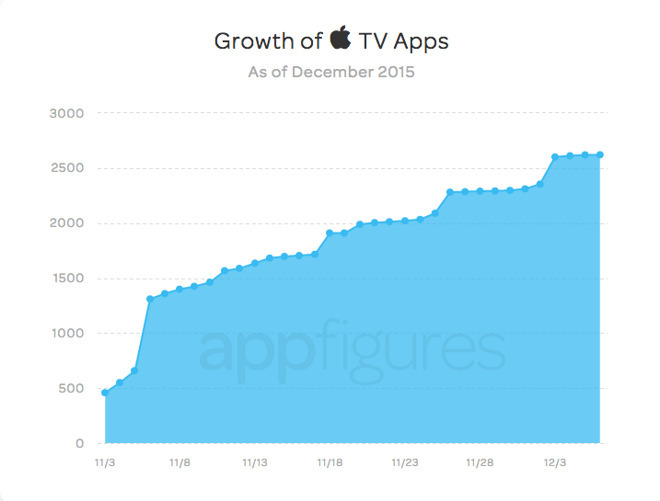 The study, published in a post to the AppFigures blog on Thursday, showed steady growth in apps available on the new tvOS platform with a total of 2624 apps now available for download. 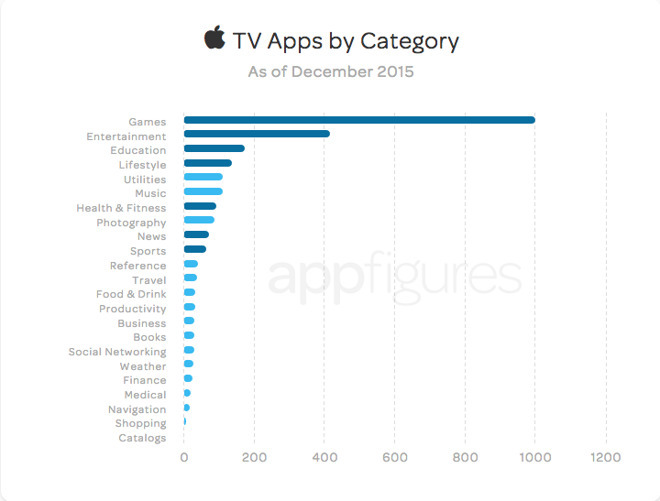 Much like iOS, the largest category for Apple TV apps is the Games category, accounting for nearly 38 percent of all apps on the platform. Entertainment and Education rounded out the top three. Despite the proliferation of games on the platform, the numbers are slightly different when it comes to what people are actually downloading. Entertainment apps actually lead the way in terms of downloads, with Games coming in second and the News category third. Moreover, of the top 50 apps, 28 of them are in the Entertainment category while only 8 of them are games. As for monetization, more developers appear to be charging users for apps, as opposed to the freemium model that currently dominates iOS. While a majority of developers are opting to stick with free-to-download apps, a full 39 percent of apps on the Apple TV App Store are paid, with developers charging mostly small amounts of $2.99 or less to download, although some are as high as $59.99. The newest version of tvOS, 9.1, was released on Tuesday.